The safety of kids is everybody's business! Research has shown that bullying, abuse, and other harmful childhood experiences cause suffering both when they occur, and throughout people's lives. Unfortunately, discomfort and lack of knowledge often make it hard to take effective action. In the last year, thanks to the #MeToo movement and more, society has finally become more willing to discuss the problems of child sexual abuse and other violence. However, if we just raise awareness without teaching people skillful responses, that just increases anxiety. Doing Right by Our Kids fills this critical knowledge gap. Doing Right by Our Kids creates "Full Circle Safety" by getting adults on the same page with detailed plans, strategies, skills and best practices for child safety and abuse prevention—in families, schools, organizations, and communities. Dr. Amy Tiemann and Kidpower founder Irene van der Zande have each reached millions of people with innovative resources that improve lives through education and empowerment. “ Doing Right by Our Kids is a field guide for practicing courage. It will arm you with the knowledge and skills you need to know when, why, and how to act to protect your kids. 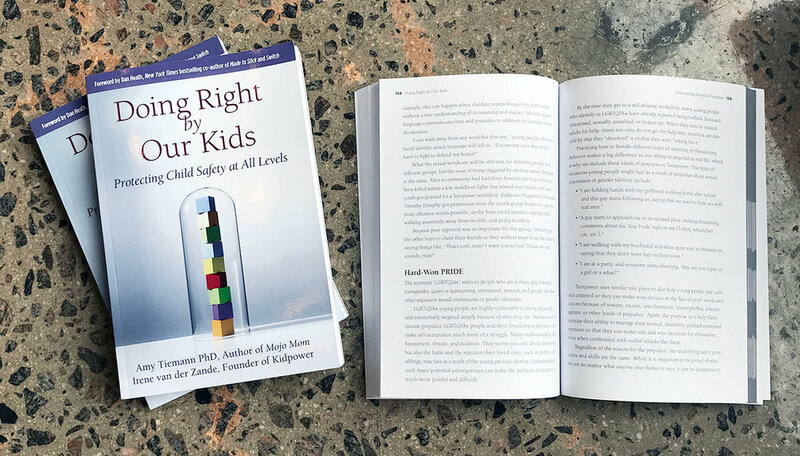 “ Doing Right by Our Kids is an essential appraisal of what every parent - and every person - needs to know to keep children safe. It delivers its wisdom with empathy and care, not fear or alarm. It treats its serious subject with dignity and respect, and, most importantly, common sense. It should be read by all of us and embraced for its cheerful, rather straightforward approach to a complex world, making it far less forbidding as a result. Journalists, teachers and organization leaders: if you are interested in writing a book review or other featured media coverage, adopting Doing Right by Our Kids as a course textbook, or buying the book in quantity to use within your organization, we are happy to send you a complimentary review copy upon request.